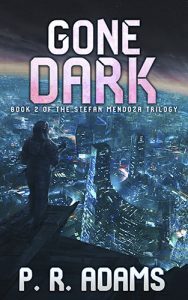 Set several decades before the Jack Rimes Trilogy, the Stefan Mendoza Trilogy is a cyberpunk techno-thriller with espionage elements told with a first-person point of view. The three books were Into Twilight, Gone Dark, and End State. The story takes place over the span of a few years and follows the protagonist–Stefan Mendoza–during the period where metacorporations come into existence. At the start of the series, Stefan Mendoza is a contractor/assassin for the Agency, an organization created after numerous problems with the United States’ failing intelligence infrastructure. Mendoza is from a small town in Idaho, an elite soldier recruited by the Agency because of his skills. His longtime handler is Brady Stovall, a man from a completely different background (money, education). 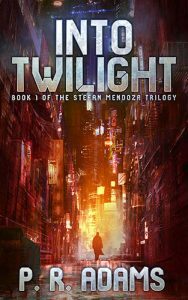 Following a failed mission in Seoul to protect the unified Korean president from an assassination attempt, Mendoza is tortured and mutilated. Just as he’s thrown into a sewage ditch to be washed out to sea, he’s rescued by Danny Chowla, the only other member of his team to have survived the Seoul mission. Mendoza is rebuilt with cybernetic limbs and eyes. His beneficiary turns out to be Heidi Ostertag, a former Agency handler with a bad reputation. Mendoza discovers that Ostertag isn’t working for the Agency but the US Chamber of Commerce. They want Mendoza to assassinate Senator Kelly Weaver, who is planning to run for president and oppose critical policies the Chamber of Commerce favors. Ostertag has already built the first elements of Mendoza’s team. Chowla will act as a sniper and drone operator. Mendoza’s Gridhound (hacker) will be Chan, a troubled teen with drug and identity problems. Mendoza is forced to take on stealth specialist Ichi, the daughter of Norimitsu, his mentor and best friend and Nitin Desai, a reckless driver. As Mendoza researches his target, he uncovers troubling elements to the job, including the fact that he isn’t the only assassin going after the senator and that maybe there’s more to the job than simply killing a senator. The story opens in Seoul but is concentrated in the Washington, D.C. area. It introduces supporting characters FBI Special Agent Lyndsey Hines, hardware expert Abhishek Varma, and Agent Merkel of the Agency. After Senator Kelly Weaver is assassinated, Mendoza is a fugitive from the law and the Agency. He heads west, eliminating contracted assassins east of Denver, then hides out in his hometown of Emmett, Idaho. He ends of falling for his high school sweetheart Margo, now married to former high school basketball star Neil Bauer. After having the cybernetic limbs that were damaged previously replaced with upgrades, Mendoza tries to settle into an anonymous and simple life, but contractors show up in Emmett, and Mendoza receives a painful reminder that he can’t run from his Agency past. This time, though, the people trying to kill him are from Cytek, a mysterious corporation. Once more on the run, Mendoza reconnects with Chan, Chowla, and Ichi. The three of them hook up with Chinese MSS agent Huiyin, who wants to shut down the people trying to kill Mendoza. Mendoza calls on old contacts to figure out Cytek’s motivations. By the end of the book, the key players and their motivations become clearer, but things are never quite as they seem. The story starts east of Denver, spends time in Emmett, Idaho, then returns to the east coast, with a stop in Mississippi. After resolving the situation with Cytek, Mendoza has retired to Costa Rica, where he hired out his yacht to tourists for deep sea fishing. He has fallen into a relationship with Ericka, a young woman who has suffered the same sort of bad luck with relationships that Mendoza has. Mendoza’s idyllic life falls apart when assassins intrude. He’s hired out by an East/Southeast Asian metacorporation known as LoDu to help them kidnap William Marshall, a leading Artificial Intelligence expert. His handler is Du-ri Shin, a member of the Korean Secret Service that failed to protect its president from assassination. Mendoza agrees to LoDu’s demands that he lead their team rather than put his own together, but he ends up rescuing Chan from the Chinese with LoDu’s assistance. Mendoza then agrees to lead an operation in Colombia, although the particulars of the mission change. Attempts to kidnap Marshall run into complications, and Mendoza ends up demanding the right to lead his own team. Instead, he’s forced to cooperate with Du-ri and compete against another LoDu team, also being led by Du-ri. Mendoza accept the terms, feeling his team is good enough to overcome LoDu’s corrupt behavior. The story starts in Costa Rica, then goest to East Asia (Seoul, Korea; Shanghai, China), with stops in Washington, D.C., Colombia, and Mexico.